That’s the question this book raises—is God someone we can trust, not only when things are going well, but when life is one catastrophe after another? In the midst of our pain and trials, can we depend on God to come through for us? Rather than spouting off unsatisfying pat answers, authors Mimi Wilson and Shelly Cook Volkhardt take the reader through a series of easy-to-understand lessons—digging into scripture to find God’s promises, and illustrating each point with examples from their own experience or the experiences of those they know. You feel that you’re sitting at the kitchen table, having tea together, while they relate what they’ve learned in the valleys of their lives. The truth of God’s goodness, the very essence of His character, forms a firm foundation for a series of practical applications anyone can relate to. Describing the Gospel as “creation, redemption, re-creation,” the authors first explain how God made us exactly according to His perfect specifications. We aren’t mistakes or afterthoughts. God knew just what He was doing. Of course, we aren’t perfect now. Our sinful natures keep us from a pure and holy God, no matter how good we try to be. We’ve all failed in some way or other. The writers clearly explain how Jesus provided a means of reconnecting with our Creator. Finally, Mimi and Shelly demonstrate how God re-creates us in our brokenness, “using the ugly things in our lives to make us beautiful.” What an incredible reason for hope! Each chapter ends with a prayer, suggestions for “Holy Habits,” and unusually thoughtful questions to spark group discussion. I would whole-heartedly recommend this book. I wish they would have written it years ago! My one complaint? It’s plain that the book is only intended for women. In spite of that, I’ll be buying copies for a number of men I know who are also struggling with these issues. 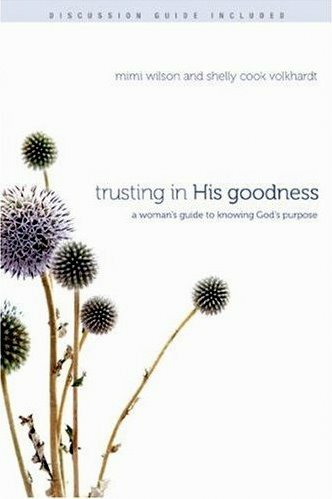 Trusting in His Goodness, by Mimi Wilson and Shelly Cook Volkhardt, published by NavPress, 2010. This entry was posted in Book, Faith & God and tagged God, goodness, Mimi Wilson, Shelly Cook Volkhardt, trust. Bookmark the permalink.